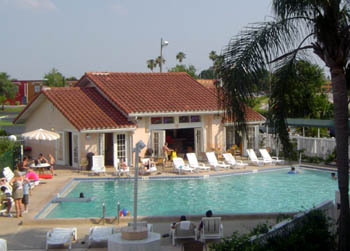 Travelodge is located near Disney World off International Drive in Orlando, FL. This page allows you to make reservations, find directions, and submit reviews about the Travelodge. Don't forget, you also get rebates on muliple day stays. The Resort is located approximately 233 miles north of Miami Beach, Florida. If you need transportation, take our $35 shuttle bus. Room Rates: Low season from $59, High season from $119. Check in: 3pm, Check out: 11am. This 192-room budget hotel is located only a quarter mile from Universal Studios. Travelodge has has a large heated swimming pool, game room, and complimentary continental breakfast is included. Nearby restaurants and attractions that are within easy walking distance to the Hotel include: Sonic, Burger King, KFC, Sweet Tomatoes, Denny's, IHOP, Fun Spot Action Park, Wet, Walgreen's Drug Store, International Festival Shopping Mall, and Wet 'n Wild water park. Free transportation to the Disney Theme Parks, Water Parks and Universal Studios from Travelodge is available by: Bus. Disney Tickets, Hotel and Round Trip Transportation. Getting to Disney is easier than you think! The least crowded time to visit is from Labor Day to Thanksgiving and from the week after President's Day (mid-February) to the start of Spring Break (mid-March). 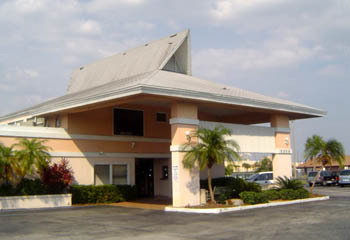 Travelodge is just southwest of Orlando, off Interstate 4, west of the Florida Turnpike. Use our Disney World Google Map to find the exact location.